This is from a little book I wrote about my experience and how I used what I learned in the afterlife to heal my earthy life many years later…. In the spring of 2000, I was finishing up the last few months of my PA training. Becoming a Physician Assistant was a long-time goal of mine, and I’d spent years of dedication and sacrifice working toward it. My husband and I had married in the fall of my first semester, and one year later, were expecting a baby. Graduating from PA school, and becoming a mother at the same time were far greater gifts than I could have imagined for myself. While I focused on finishing up my clinical rotations, and studying for my board exams, I’d daydream about all the things we had to look forward to. My husband and I had moved from New York to Florida in January of 2000, and in February, went for my twenty-week ultrasound. As the physician ran the probe over my belly, he showed us our baby’s skull and femur, all the while taking measurements. “The baby is right where it should be developmentally,” he said, looking pleased. As he continued to move the probe, we caught a glimpse of our baby’s foot. I pointed out one of the toes to my husband. “That’s your child, no doubt about it!” Our baby’s second toe was crooked, just like my husband’s. We were laughing about this when the doctor’s demeanor changed. In the practice of medicine, when forming what is called a “differential diagnosis,” all things that may be the cause a person’s illness must be considered, until ruled out. The term “think horses, not zebras” serves as a reminder that the most common cause is most likely the cause. As we waited through the weekend for our OB appointment on Monday, I researched the differential diagnosis of hydronephrosis, or excess fluid in the kidney, and tried to be positive about its root cause, telling myself it was something simple that she would grow out of. Although I tried to think horses, my thoughts kept leading me back to zebras. While my husband and I worried, my mother-in-law mentioned she’d had a problem with her kidney when she was younger, and underwent a corrective surgery for it as an adult. We determined her surgery must have been for an ureteropelvic junction (UPJ) stricture, or narrowing, of the tube draining urine from the kidney to the bladder. With this newfound knowledge, everyone breathed a sigh of relief. Our baby’s problem must be hereditary! It fit with what the ultrasound showed, and was fixable. My thoughts quickly turned to horses, and remained there through the rest of that long, emotional weekend. Monday morning my husband and I met with my OB, who agreed that our baby’s problem was most likely due to a congenital malformation of the ureter, and we made the decision not to undergo any further testing. Four months later, in the last month of my pregnancy, my OB brought up the option of early delivery. I could be induced at thirty-five weeks, and a Pediatric Urologist could evaluate our baby’s kidney function sooner, rather than later. It wasn’t imperative that she be delivered early, but the option was there. While I tried not to be, I was afraid if I didn’t go along with this plan, I might be jeopardizing my baby’s long-term health, though I still hesitated in giving an answer. Delivering her early would require for me to be induced into labor, and I knew the possibility of a c-section was greater with induction. I wanted to have the experience of childbirth so badly, but couldn’t hold on to that desire. One week could potentially make a difference, so I decided to go ahead with the induction. On the evening of July 16, 2000, I was admitted to the hospital’s Labor and Delivery floor to begin the process. I was a carrier of the bacteria Group B Streptococcus, which would put my baby at risk of developing an infection while moving through the birth canal. I required pre-treatment with antibiotics before the induction started. The Penicillin had been running through the IV for only a few minutes, when I noticed a strange feeling in my chest. It felt like my heart was racing and beating irregularly. I told the nurse what was happening right away, and she stopped the IV. Seconds later, the feeling in my chest disappeared. Another antibiotic had to be given, and as the nurse flushed the IV to push through the medication still in it, the feeling in my chest briefly returned. The only explanation was that it must have been some sort of an allergic reaction. This surprised me, for as far as I knew, I wasn’t allergic to anything, but could have developed an allergy during the course of my pregnancy. Another antibiotic was chosen and administered without the return of that strange feeling. As my husband, mother and I settled into the hospital room for a long evening, Pitocin, the medication that would tell my uterus to begin contracting, was started. Although I have no real memory of it, I was told the night was rather uneventful. That was fine, because what followed the next morning would more than make up for it. The next morning, my contractions were strong, but irregular. By eight o’clock, I had dilated only 3cm. The nurse midwife broke the amniotic fluid sac to further my labor along. It had already been thirteen hours, and I was progressing too slowly. Prolonged labor in a patient who was a Group B strep carrier increased the risk of infection in the baby with every passing hour, even with the administration of the antibiotic. Although I wanted to resist the thought of it with all my might, I knew a c-section was in my near future. Pitocin causes unusually strong contractions, and even though I had dilated only three centimeters, I was in a lot of pain. Figuring I’d need it anyway for a c-section, I asked for an epidural. After this was placed, I lay there watching the monitor next to the bed. I knew what to look for on the screen, and noticed when I was having contractions, my baby’s heart rate would occasionally drop into the sixties. This was dangerously low, and I anticipated the arrival of the midwife into the room to deliver the news . Sure enough, less than a minute later she was there, telling me what needed to be done. Although I knew a cesarean would most likely be the outcome, internally I still had a brief, but strong emotional resistance to it, much like the way I’d resisted the thought of having our baby early. Between now and the surgery, constant and close monitoring of my baby’s heart rate was needed, so an internal monitor would have to be placed into my baby’s scalp. I’d placed them before myself, yet cringed at the thought of something being screwed into my own child’s head. As these thoughts ran through my mind, I felt the same fluttering feeling in my chest that I’d had the night before, only now, it was much more severe. “I’m having a hard time breathing.” No sooner had the words left my lips that I went from being a little short of breath, to gasping for air. A huge commotion broke out in the room, and I was yanked onto my left side as this would make it easier for my heart to pump blood to my unborn baby. Someone slapped an oxygen mask over my face. My husband and mother were quickly moved out of the room and into one down the hall. I couldn’t seem to get enough air, and had to work harder and harder to breathe. In a matter of seconds, I was being wheeled out of the room and through an open hallway. Within only a few feet from the OR suite, the noise that had surrounded me became distant. As I faded away, the last thing I recall was the sound I made. It was one of desperately trying to breathe. My heart stopped at 9:18 am. There is no such thing as “the moment of death”: The point at which there are no signs of life, and when our consciousness leaves our body, is more of a continuum. From an awareness standpoint, some time had passed between being in the hallway, and the view I had from above. What happened to my consciousness during this interval, I do not know. Perhaps my energy coalesced into a singularity before exploding outward in a cloud of tiny black-grey particulate matter. Maybe it leaked from the confines of my solid-self, little by little, rapidly accumulating into a loose conglomerate of static-like matter that was now floating above my body. The distance between my conscious self and my body below seemed to be stretched out, as if space-time had elongated, and my now nearly immaterial self was simultaneously both near and far away from my material body. There was no sound, no pain, no fear. I could still “see”, and glanced around the room. The ceiling had taken on a fluid transparency with some flowing, solid features that still remained. I could see someone lying on a bed. Was it a person? I recall asking myself this question, as I wasn’t quite sure what “people” were, but seemed to have a recognition of them nonetheless. The event unfolding below me no longer involved “Krista” in the physical sense, as she was now beyond the transparent ceiling. As I lingered above, I didn’t identify in any way with the body or the people in the room, but was instead a detached observer, although still “Krista” within the fine static of my consciousness. I had retained my earthly identity, and felt more alive than ever. There were several people around my body now. A person in blue, was on the left. At first, I noticed him bent over my body at the level of my abdomen. He then, very quickly, stood upright and handed a bundle to someone at my right shoulder. They took this bundle, and quickly turned their back so I couldn’t see, and I wanted to see! A person was near my head, placing something on my chest. Another person in blue walked into the room and stood there, as if assessing what was happening, then moved to my right side, joining in on the barrage of activity around me. I felt so compelled to stay. What was in the bundle? What was happening to the person on the bed? As I continued to watch, I slowly became more and more attached to what I was watching. Suddenly, an invisible force began pulling me to the left. I resisted it for a brief second, but this force was much stronger than my desire to stay. It wanted me, and I knew whatever it wanted me for was important, more important than my desire to remain fixed in this place. With this understanding, I then made a conscious choice to let go. The instant this decision was made, I was moving at a terrific speed through, what I can only describe as, a loosely confined space of static and fluid-like matter. It was infinitely large, yet immeasurably small. I felt, at any moment, it would either burst wide open, or collapse in on me. No definition existed between my consciousness and that of its “walls,” which were made of this fluid, static-like continuum of energy. As I sped along, I became intermixed with this energy, and the further on I went, the more I felt permeated with its indefinable, irrefutable, unbounded love. This love and I were wholly immersed in one another; no point of separation existed; I was it, and it was I. Oh, what bliss! I felt no pain, no anxiety, no fear. The only feelings were that of love, and peaceful contentment. I wished for nothing, as there was nothing to wish for. Within this space, I was simultaneously given the answers to all the questions I’d ever had in my earthly life, with the exception of one. There would be one question that I would not yet be given the answer to. It was at this point that I veered off to my right, toward a thick, foggy-dense, whitish-gray atmosphere. As I rapidly approached it, I could make out dark, ill-defined figures. They were huddled close together, just on the other side of the entrance. They had a human-like form, but could only be seen as shadows of this form. I recognized one of the figures in the front to be a little boy. He was the first to come into view, and had the appearance of a shadowy little Tom Sawyer, with a wide brimmed hat and overalls. He wanted to be at the front, and desired for me to take him back into the physical realm. The others who gathered around wanted him to be there as well. They sensed my desire to help, and were using him to draw me in. I felt discomfort upon entering this realm. It didn’t feel as loving a place as the one I was just in. I could have left, but wanted to help the little boy so badly! As I moved further into the space, the others wished to take advantage of my desire to help, and came at me all at once, their need and want pulling at me from every direction. They were so sorrowful and had such yearning to leave! Initially, I wanted to save them all, but knew it was far too great a task for me to take on. Overwhelmed, I then wished to leave that place, and the instant the wish presented itself, I was moving away from the dark grey figures, away from the little boy, and didn’t look back. I had changed my experience through my own intention, and was once again intermixed within the space of boundless, divine love, but was only briefly in this space, when I again, through my own intention, traveled through a sort of gate, or passageway, where I emerged into what I call my Eden. I carried this love with me through the gate, and was pure, conscious awareness of this love, and with all I witnessed around me. Upon traveling through this gate, I felt instantaneous immersion with all I witnessed around me. I was one with the vibrant yellow flowers spanning out on the ground in front of me. I was one with the sparkling waterfall cascading down huge rocks into a pure, crystal pool. I was one with the distant, rolling green hills, and tranquil blue sky above it. I was one with the deep, dark evergreens edging the field of flowers to my right. What joy it was to be in this place! I felt every bit of the landscape was a unique expression of the Divine that was chosen for, and by, me. The dense forest contrasted with the striking scene of vibrant yellow flowers and cascading waterfall. Intuitively, I knew what lay within these trees was neither good nor bad, and that I was a part of it, as well as all the other things in my beautiful Eden. I had the choice to venture into this dark place, but felt a sense of already knowing what my experience would be there. Instead, I chose to stay where I was. I didn’t need or want to experience anything other than beauty, although the forest also held its own kind of beauty. Then, from the love that was both within and around me, it was communicated to me that I had one of three choices to make. First, was to move forward, into the woods. However, I’d already rejected that. The second choice was to continue onward to what lay beyond my present reality, and the third was to return to my body, and resume the life I had left behind. However, if I chose this, I was to share my experience through being of service to others. I looked at the beauty around me, once again feeling the enormity of it; the love, peace and oneness of it all. My pulse returned at 9:26 am. When I died 14 years ago during labor with my daughter, I had the experience of being out of my body and far above it, looking down and watching the barrage of activity around me. I saw particulate matter/energy rush toward me from my body below and accumulate where my vision already was. The eyes truly are a window to the soul. I’ve wanted to take the time to sit down and write about the parallels between my NDE and the different world religions. My NDE contained within it concepts of Hinduism, Buddhism, Christianity, Muslim as well as the Law Of Attraction. I will be posting here as I do make these parallels. I’d love to hear your opinion! Check out my interview with Lee Whitting of IANDS NDE radio! 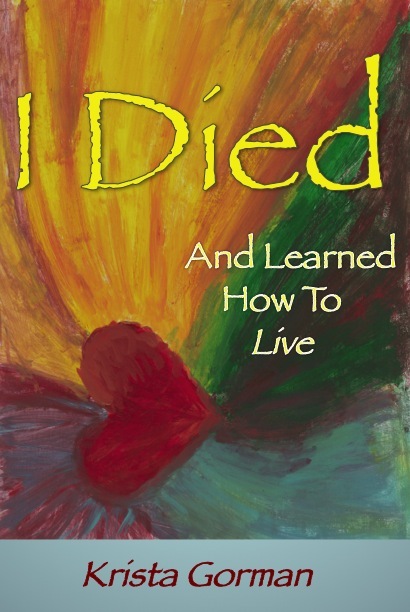 I Died…And Learned How To Live is an introduction to my story of death, return, and profound healing that took place in my life afterward. There were no words in our human language that could adequately describe my experience of death, and I spent years trying to reintegrate myself back into my preexisting life while not having a means of expressing what I’d gone through. The feeling I had of unbounded love not only for me, but for all there is, couldn’t be translated in any way I knew, so out of frustration, I chose to keep it to myself for many years. After experiencing challenges in life that led me back to my experience, I was able to describe it in what I call the Twelve Principles For Daily Living. When I lived those principles, my life and the lives of my family transformed. When practiced freely, without reservation, they have the potential for the creation of a life that is the closest I’ve come to recreating my death experience here, on earth. They are what I used to heal my life, and the lives of my family.